Molly's Revenge is a dynamic, acoustic Celtic band known for its unique and infectious enthusiasm. The classic combination of bagpipes, whistle, and fiddle, with a backdrop of guitar, mandola, and bodhran guarantees an enjoyable experience for all fans of Scottish and Irish music. Molly's Revenge has performed at many of the top folk festivals and performing arts events in the USA, and prestigious events in Scotland, Australia and China. 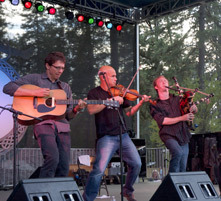 Their arrangements of traditional Celtic jigs and reels bring these dance tunes up to date with a driving, hard-edged accent that always leaves audiences shouting for more. Band members are David Brewer on highland bagpipes, border pipes, uillean pipes, whistles, bodhran; John Weed on fiddle; and Stuart Mason on guitar and mandola. Bagpiper David Brewer is one of the most energetic and charismatic performers of the Scottish pipes in the world today. His pure joy and passion for playing is evident at every show. His authentic and unique style of playing has earned him the reputation of being one of the most accomplished pipers on the West Coast. He has been playing whistle and four types of bagpipes for about 20 years. He studied in Scotland at the Ceolas Music School in South Uist under the tutelage of some of the best pipers in the world. David has composed close to 200 traditional style tunes, many of which have appeared on recordings, independent films, and television. An accomplished fiddler across genres, John Weed has lived in Ireland and immersed himself in the traditional styles of Clare and Donegal. The result is an old-time Irish fiddling style that compliments his forays into bluegrass, swing, and other American music. A classically trained violinist, John leverages his understanding of the instrument to coax emotion from every tune. John also performs regularly with old- timey trio Little Black Train and the Cajun combo Sons of Fortune. Film credits include fiddle tracks for the NBC adaptation of Anita Shreve's novel The Pilot's Wife. Stuart Mason has been collecting and performing traditional music for over 35 years. He has appeared on stage from Ireland to China performing Celtic, old time bluegrass, and his original compositions, which have won awards from the West Coast Songwriters Association. He leads workshops and classes in traditional music techniques at music festivals and camps. Stuart also performs with Little Black Train and holds down a weekly residency in San Luis Obispo with the Old-Time Fiddle and Banjo Show.